The winners of the 2011 International Seafarers' Welfare Awards were announced Monday 31 December during a high profile ceremony at the International Labour Organisation in Geneva. The ceremony, which took place on the opening night of the Maritime Labour Convention tripartite meeting, was hosted by Mr Michael Grey, ex Editor of Lloyds List and attended by a number of key players in the industry including Mr Arthur Bowring, Managing Director of the Hong Kong Ship Owners Association and Mr David Cockroft, General Secretary of the International Transport Workers Federation. 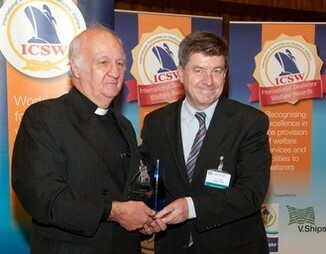 It was a special evening for the Revd Peter Ellis (Monday, Dec 13) as his illustrious career of serving seafarers was recognised by the International Committee on Seafarers' Welfare (ICSW). The awards – voted for by the world's seafarers – recognise outstanding achievement in crew welfare and focus on various categories including best port, company and seafarers' centre. Peter was nominated in the award's welfare personality category – a testament to his familiar and friendly face around ports in Asia and Europe for the past 40 years. Ordained in 1969 and joining the Mission to Seafarers in 1974, Peter has been the face of the Flying Angel in Hong Kong, Singapore and Teesport. Until his retirement earlier this year, he spent 20 years as the port chaplain to the bustling port of Hong Kong. Here, Peter became a familiar sight on the port and in the water as he visited ships using the Mission’s launch. Armed with regional newspapers, European football DVDs and telephone and SIM cards, Peter met thousands of seafarers during his career and helped with a wide range of problems. The Mission’s launch also provides vital transportation for seafarers wishing to get ashore, as water taxis are prohibitively expensive. 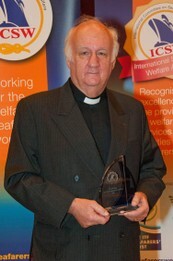 On hearing the news of Peter's award, the Secretary General of The Mission to Seafarers, the Revd Tom Heffer, said: "The work for which Peter has been rightly honoured exemplifies the spirit of the Flying Angel which is known and loved by crews the world over. In 250 ports our dedicated chaplains stand ready to assist all seafarers regardless of their nationality, rank or belief. Peter has served with selfless commitment and has been instrumental in strengthening links with the maritime community of Asia and we thank him for his service."